I dream of the day when you can pop into a 7-11 and grab a green juice and a bag of kale chips. But until then, making progress towards our health and weight loss goals while on the road takes a bit of planning, flexibility and ingenuity. I cut my teeth on the subject in the most ridiculous way possible. Imagine this: You’ve just gone plant-based, your best friend (also named Matt) calls you up — he’s engaged! And there is going to be a bachelor party! And the bachelor party happens to be a 5-day party/rafting trip with 8 other guys! For me, this was a challenge akin to when I strapped on skis for the first time at an aerial ski jumping camp. Needless to say, I spent a good two weeks figuring out what I was going to take to eat on the trip. And what did I end up eating? Probably close to my body weight in avocados, hummus, and almond butter. And the great thing was that I had a blast! I didn’t miss out on this important event, and I had the time of my life with some of my best friends. I’m not sure why we decided to run around throwing bocci balls into the air during our rafting trip…but it was awesome! A couple weeks back Regan and I finished a 5-day trip of our own — a move across the country from Arizona to Washington DC. Road trips are a bit easier than some of the other travel challenges, and I was amazed how little effort it took to stay plant-based on the road. So today, we thought we’d pull back the kimono and share our best tips and tricks of how we eat like plant strong foodies on the road. This is just our take, and I’m sure you have tips and tricks of your own. Share your best travel strategies in the comments! There is one golden rule to healthy air travel: Take your own food — the more hydrating (ie salad, cucumbers, veggies, sprouts) the better. I don’t know why it took us so long to realize this, but you can prepare a meal in advance, put it in a tupperware and take it on the plane! We usually will put together a big salad or stop by the hot bar at whole foods before heading to the airport. In addition to one pre-made meal, we also take some snacks along with us. For example, we’ll often find a standard mexican restaurant or burrito bar and order a couple sides of guacamole and pico de gallo. These sides make great dips for Mary’s crackers, or we add them to a tortilla along with our spinach and volia — filling and delish veggie wrap! Another good option is to order a bare bones salad anywhere you can find one and supersize it with the addition of avocado, hemp seeds and hummus. Finally, it’s important to understand that decisions, stress, difficult social interactions and walking past restaurants when hungry all place a strain on your willpower, and this strain is cumulative! That’s why I like to make sure we have enough food to not feel deprived, with the addition of a special treat. Make sure you are well prepped with the right food in situations where you are likely to be stressed. Filling up on the right food makes it much more likely that you won’t stray. We pack all our snacks in a canvas grocery bag that we take on the plane in addition to our regular carry-ons, and we have never been hassled about the extra bag. Green juice on the road! For us, the cooler bag is the rosetta stone of the perfect plant-strong road trip. It allows you to go where you will and still eat like you are just a few minutes from your favorite Whole Foods. Oh, and the cooler bag can also substitute for a fridge if you are staying at a hotel that doesn’t have one. 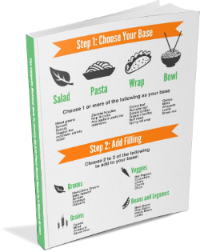 We stock ours with the essentials and use the Chipotle Method to put together most of our meals. We stopped for dinner at a rest stop in Arkansas and decided to make a little video to show you how we make a typical meal on the road. We are almost certainly more food obsessed than the average traveler, so we go out of our way to plan ahead and check out appealing restaurants along the way. When eating out, we use the same strategy of thinking ahead and seeing what we can buy to bolster future meals. For example, at the Whole Foods in Memphis we couldn’t figure out what we wanted to eat for lunch. Finally we purchased a few different items from the cold bar and ended up with potatoes, quinoa, broccoli, seasoned kale salad and hummus. We then used the leftovers of these items over the next couple days to add to wraps, salads and just to have around for snacks. Though we have a long way to go, there are more veg friendly options and restaurants than ever before. We use yelp and happycow.net to find accommodating restaurants along our route. Chipotle is a good alternative of ours when nothing else is available. It is a national chain with relatively fresh ingredients, works well both for the veg heads and omnivores and can be found in most moderately sized cities. In addition, we’ve found that the following kinds of restaurants tend to have available or easily adaptable options for us. One of our little secrets is to look for Hari Krishna temples with restaurants. They usually offer healthier than the norm indian cuisine with lots of delicious options, are inexpensive and have super fresh ingredients and a fun atmosphere. We stayed with our dear friends Phebe and Mac in Dallas, and they treated us to an amazing meal at Kalachandjis, by far the best Hari Krishna restaurant we’ve ever been too. Thanks guys! Regan and I are super fortunate to share the same dietary preferences, and we know that not everyone has this luxury. Especially when traveling for business or with family that doesn’t share your values, it can take a lot more compromise and duct taping things together to make it work. When I’m out with others, I never like to dictate the choice of restaurant based on my preferences. I might make a recommendation or two (making sure there are good options for everyone) and then let everyone else decide what they want. Last month, I attended an organic farming conference in Wisconsin for work, and ended up going out to eat at a steakhouse with a group of organic seed producers. I didn’t want to make a fuss, so once we arrived at the restaurant I slipped away and talked to the server privately. I asked if she had any vegan options or suggestions of what I could eat. She gave me a couple good recommendations, and I was able to enjoy a fantastic meal without creating any social awkwardness. Nine times out of ten I’m able to make a meal at almost any restaurant work. Sometimes though, there just really aren’t any options. Or they are extremely limited. For these cases, I will usually carry with me my trusted salad expansion pack. I’ll take with me an avocado or two along with some hummus. I might also bring my own salad dressing, olives, crackers, pumpkin seeds, or anything else to add a little zing to a meal. I’ll then order as many house salads or side salads as necessary to get a decently sized meal and add my ingredients to it. Is it awkward to be sit down to dinner with friends, family or complete strangers, slyly reach into your jacket, pull out an avocado and/or hummus and/or olives and start adding them to your salad? Not if you do it with a smile and a wink! But yes, it might put you out of your comfort zone. Be confident. Smile. Delight in how funny it is to be the one pulling condiments out our pockets and everyone else will think it’s funny too. I sent this to my Mom to proofread and she mentioned that family is usually happy and relieved that you have something to eat! This process is all about learning how to dance. We are always becoming more adept at staying true to our health and values while ensuring that we can still participate in the fullness of life. Traveling and social situations can be a big barrier, but they don’t have to be. And I promise over time you’ll develop your own methods for making things work. Now, I wouldn’t think twice about what I was going to eat if I was heading out on a five day rafting trip with my best friends. Have a funny travel story or addition tips to share? Let us know in the comments. We’ll read every one.